so much music, so much silence. This entry was posted in Insects etc. and tagged animal, beetle, biodiversity, bioluminescence, bug, childhood, closeup, dusk, eastern firefly, energy, evening, firefly, flower, fun, glow, glowworm, grass, happy, insect, invertebrate, lawn, light, lightning, lightning bug, luciferase, luciferin, macro, memory, nature, night, Photinus, Photinus pyralis, summer, wild, wildlife. Oh man, this is excellent! Remarkable and wonderful capture, love your style! Absolutely phenomenal! What a shot! I always love seeing your posts, Rick! Wowie kazowie! 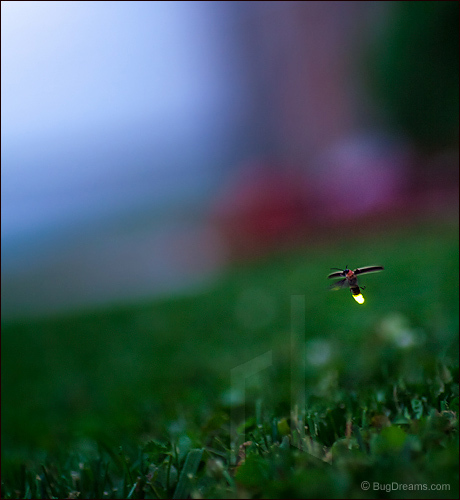 I so want to get a shot of a flying, lit-up lightning bug! Every firefly photo stuns me. I have a question though, perhaps I’m asking for the impossible…have you ever managed to do a true macro on a Firefly, getting really really up close whilst its lit? I imagine that to be extremely difficult, then again it would be such a unique shot. Woot! Nailed it! Well done! Very nice minimalistic photo here! First in flight, longing for those warm nights to see the fireflies. You can hear their music if you listen close, they make my heart sing! Sweet gift this capture Rick! Thanks Diane. Just a few weeks away. I love the layer of grass in the depth of field. Awesome! Beautifully done, you have turned it into something really special! Impressive focus!!!!! Very nicely captured. Gorgeous shot!! Thanks for sharing with +Grass Tuesday ! !